Are you looking for a new mobile game to play this weekend? There are lots of new options available for you to try, including Wheel of Fortune Slots: The Ultimate Collection from GSN Games. The slot machine game contains a variety of slot machines inspired by television show Wheel of Fortune. Next, Sentient Play launched Komrad on iOS. The interactive chat game allows users to interact with K.O.M.R.A.D., a Soviet supercomputer powered by artificial intelligence, which was left on when its military base was abandoned 30 years ago. In addition, Ubisoft, in conjunction with CBS Interactive, launched NCIS: Hidden Crimes this week. The hidden object game allows users to solve crimes alongside Gibbs, Abby and other characters from the NCIS television show. Elsewhere, Nexon and This Game Studio launched Oz: Broken Kingdom. The role-playing game introduces players to Ophelia Shen, a young girl who joins Tin Man, Lion and Scarecrow on a quest to save the land of Oz from darkness. Finally, 505 Games and N-Fusion Interactive launched Ember. The role-playing game allows users to become a hero called the Lightbringer. Users will need to decide whether to protect fallen stars called Embers, or to use the Embers for their magical powers. If you’re looking for something different to play, here’s a look at some of the additional mobile games that were released this week. 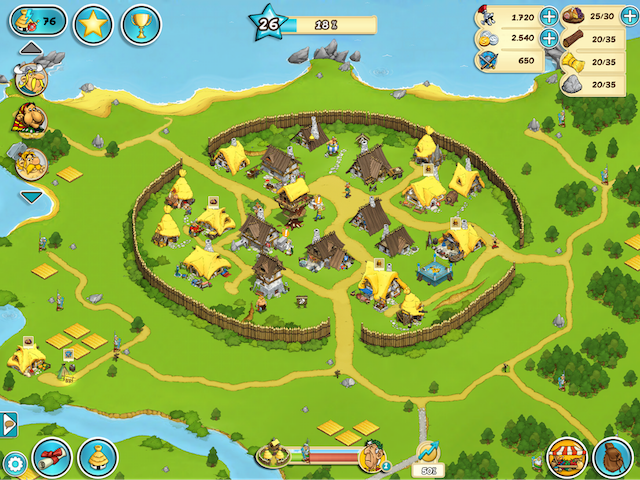 Asterix and Friends (Free on iOS, Android) – This village-building game from Bandai Namco Entertainment Europe and Sproing allows users to build their own Gaulish villages, and to help Asterix and his friends fight back against the Roman army. Users can collect resources like straw, wood and stones, and they can use these resources to construct and upgrade buildings in their villages. Users can also turn basic resources into other items in the game’s crafting buildings. Finally, users can send their characters into battles against the Roman army. Minecraft: Story Mode Episode 8: A Journey’s End? ($4.99 on iOS, Android, Amazon) – This final episode in the eight-part series from Telltale Games challenges players to compete in “a series of gladiatorial games” to win their freedom. While playing, users can make decisions that may impact the way the story plays out. Users can purchase this episode for $4.99 within the existing Minecraft: Story Mode app. The Minecraft: Story Mode app currently costs $4.99 to download on iOS and Amazon, and $1.99 to download on Android. In addition, users have the option to purchase Episodes 6-8 in a bundle for $11.99, or Episodes 2-8 in a bundle for $24.99. Crystalux New Discovery (Free on iOS, Android) – This puzzle game from IceCat asks users to drag hexagonal shapes around the playing field with the goal of making the colorful crystals on each shape touch other crystals of the same colors. Levels become more complicated as players progress. For instance, shapes may have more individual crystals to match, and additional colors of crystals may be added to the game. Tower Rumble (Free on iOS, Android) – This battle game Neo-Realms Entertainment asks users to destroy the enemy’s three towers before their own towers can be destroyed. The battlefield is split into three vertical lanes, and both the player’s and the enemy’s troops will automatically walk down these lanes during battles. While playing, users can help their troops by casting spells from the bottom of the screen. Each spell has a color, and users can create combo bonuses by casting two or more spells of the same color in rapid succession. The first three campaigns of Tower Rumble are available for free, and players can unlock three additional campaigns and bosses via an in-app purchase of $2.99. Higher Higher! (Free on iOS) – This endless survival game from Pine Entertainment asks users to tap on colored portions of the ground when a moving cube of the same color is on top of them. The cube changes color each time players correctly tap. As games progress, the cube speeds up, increasing the challenge.